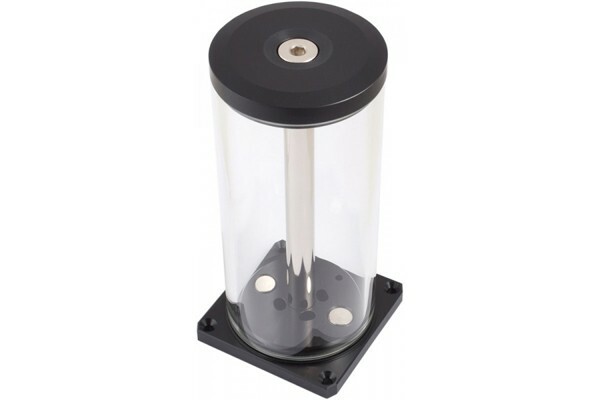 The reservoirs of the aqualis series feature a tube made from borosilicate glass, featuring, unlike the common Plexi reservoirs, very high hardness and scratch resistance paired with low thermal expansion and excellent chemical and thermal resistance. An outer diameter of 75mm and a wall thickness of 5mm ensure high capacity and sturdiness of the reservoir. Bottom and top piece of the aqualis series reservoirs is made from Delrin, a nickel plated brass tube connects them. The aqualis base for pump adaptors have connection flanges at the underside and can only be used with a suitable aqua computer pump adaptor! Optionally up to two lighting modules can be installed in two G1/4" threads (lighting modules not included). All versions are also available with a Nano coating which lets water drip off of the inner wall of the glass tube. Please note: The reservoir can only be used in combination with a suitable pump adator. The pump adaptor is not included, please order separately! The versions for pump adaptors have no water fountain effect!